When you absolutely need to sleep and can't, this is the safest, most natural way to get some, and it really works. I have severe anxiety that often has lead me to many a sleepless night. While most of my college years I took various sleep aids, it was in my final year that my roommate suggested trying Melatonin. I never felt like I was "knocked out," but I rather I was able to get a natural feeling good night's sleep. Natural, affordable, no prescription, and it actually works. Even though it is a natural sleep aid, one is still introducing a substance into your body to enduce sleep. i love to sleep and when i can't fall asleep i am angry. I dont like using sleep aids because they more knock me out than put me to sleep. this was calming and nice. I turned to this product when i became concerned that I was relying too heavily on harmful sleep aids and things like tylenol pm to help me sleep. I have always had insomnia and feel like it is a constant battle trying to find something safe to help me sleep. While this doesnt give me the extreme drowsiness of the other medications, it does nicely lull me to sleep its just in a different way it seems. Gentler. However because of its gentleness, a rather hyped up mood can seem to completely counteract its affects leaving you not sleepy at all. Calm down before bed and before taking it by watching a movie or reading and then take it and it should work. Can be easily overpowered by an agitated mood. This melatoin works well at helping you sleep naturally. I have insomnia and this product helps me sleep without knocking me out and making me feel drowsy the next morning. I like that it is natural and I don't worry about growing dependent on it or side effects like with sleeping pills. It also feels more like naturally falling asleep and doesn't cause drowsiness the next day. It doesn't always work for me. Probably 75% of the time it helps me sleep but sometimes it doesn't. I've used several brands of melatonin and don't see any real difference between them. I was an extremely sound sleeper until my oldest daughter, then six months old, woke me by her breathing stopping. I picked her up and shook her and she resumed breathing, but stopped twice more on the way to the hospital. She's 45 now, but my body still tries to stay alert when I want it to go to sleep. Melatonin helps me to get to sleep and stay asleep. 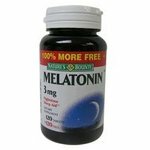 It is a good product, especially for people who must avoid the sun and therefore do not make their own melatonin. It does what all melatonin does. I went to this product after having major problems with ambien. While it took my body awhile to readjust, I think Nature's Bounty Melatonin made a huge difference for me. I suffer from chronic pain and any natural product that I can take to replace a pharmaceutical is a relief. These are great to use when you travel overseas. Really seems to help me avoid Jet-lag. Effective in preventing jet lag. Really works well for me, I even take it if I have trouble sleeping at home. Make sure you check with your MD before taking this supplement. I use Melatonin on an occasional basis as an alternative to regular sleep aids. I have found it works great! It takes a small amount and helps me relax for the whole night. It does make me feel a little drowsy the next day but it wears off and I do not use Melatonin daily. It lasts for the whole night! I experience less side effects with Melatonin than with traditional sleeping pills. It does make me feel a little drowsy the following morning. I've used Melatonin for quite awhile. It helps me fall asleep but doesn't give me that "hung over" feeling in the morning. It easily lets go of you so you can go about your day with a good night's rest. Natural sleep aid without a prescription of the stigma of using "sleeping pills"
I had been having problems sleeping at night for a while. I have a very fast paced, stressful life with two teenage boys. I tried other products, but this one has helped me relax and be able to get a decent nights sleep. Itr's also a natural product that doesn't make me feel tired in the mornings. Able to get a decent nights sleep now. Nothing I don't like about this product. After over a year of using over the counter medication to help me sleep, I really wanted to switch to something natural. I read about melatonin in a book on how to deal with anxiety naturally. I have been using it ever since. I take it regularly but not every night. It works great and I would recommend it to anyone with sleep issues. My mother has used this product to help her with sleep. Because she caters and must get up around 3:30-4:00, she needs every bit of sleep she can get. This natural product definetly helps do the job. Being a woman, I have those occasional nights where I have a hard time falling asleep. After discussing it with my sister-in-law she recommended Melatonin. she took it for a year before it stopped helping her sleep. I think it works great, I usually take it a half hour before bedtime and before I know it I am sleeping not laying awake! I like how it is all natural. Just like sleeping pills, you need to take it when you will get 8 hours of sleep or you will be drowsy.